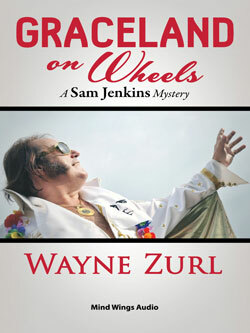 Sam Jenkins has been fishing all his life, but he’s never caught anything more interesting than the dead body of an Elvis impersonator. While the chief and Deputy Sheriff Jackie Shuman are angling for trout in Crystal Creek, Sam hooks the body of Garland Humphries, a murdered man wearing a white leather jumpsuit. Garland had been a human train wreck just looking for a place to jump the tracks and let his cowcatcher plough into the soft earth of east Tennessee. Garland Humphries awoke with a bucket of composted cow manure in his mouth—or so he thought. When he raised his head, bolts of lightning flashed before his eyes and a mule kicked him in the forehead. Using the strength of three men to open his eyelids, Garland saw dried vomit on his white jumpsuit. Fearing what it would cost to clean the sequined leather garment, he began to shake his head, and received another kick from that troublesome mule. The smell of his breath reminded him of the stench in a cesspool. He needed to wash the putrid taste from his mouth and gingerly attempted to sit up. Swinging his legs off the wide mattress felt like he just cleared a high hurdle. But when he stood, an image of the Milky Way covered his field of vision and caused him to sit quickly. Garland sucked in a large volume of air attempting to stop the spinning sensation and after a few seconds, he again tried to stand. That time he made it. In a few moments a flicker of confidence radiated from his head, through his body, and down into his legs. He took a step, then another, and felt the all too familiar sensation of his brain being too big for his skull. He decided to look for a bottle of aspirin, but really wanted a glass of Jack Daniels to clear his head. When Garland reached the doorway of the bedroom in his big RV, he looked down the narrow hallway toward the little kitchen, the dining and sitting areas, and finally the driver’s and passenger’s seats and the door. The hall between him and the wide open spaces looked like a tunnel, with walls no farther apart than the width of his shoulders. The kitchen was no more than fifteen feet away, but it seemed like a hundred yards and he began to feel claustrophobic. The sides of the tunnel started to pulsate. Garland saw stars again. Bile collected in his mouth and nausea overtook him. Garland Humphries needed a toilet or a bucket—fast. He ricocheted off the walls and the first door he found opened into the combination toilet closet and shower. Garland dropped to his knees, hugged the commode, and lost the contents of his stomach in two great heaves. Unable to move for what seemed like an eternity, Garland mustered the strength to push himself upright, turn, and use the sink as a crutch. He scooped up hands full of water to rinse his mouth and splash on his cheeks. When he stood, Garland couldn’t focus on the pathetic drunk staring back at him from the small mirror and opened the medicine cabinet looking for a bottle of mouthwash. The childproof cap caused major problems, but finally, he took a drink, rinsed, and spat into the sink. That accomplished, he grabbed a bottle of aspirin, cursed the cap, opened it with his teeth, and swallowed half a dozen. Leaving the toilet and sink as they were, Garland moved toward the door of the RV and opened a portal to fresh air and the outside world. As most drunks would, he exaggerated a careful descent of the two steps and without falling, found himself on solid ground. The noise of the slamming door erupted inside his head. By anyone’s standards, Crystal Creek is a proper little river. But it’s not as big as the Little River, into which it empties near the site of the old Cherokee town of Ellejoy, a place now an agricultural research center for the University of Tennessee. Jackie Shuman and I were fishing a deep pool on an outside bend of Crystal Creek. He with a float and fly attached to an ultra-light spinning rig and me with a rubber bug called a Trout Magnet attached to a small jig head. “Why don’t you git yerse’f some new fishin’ gear?” he asked. I retrieved the lure and cast it upstream, watching it move with the current as I cranked the handle on my Orvis reel. Then I snagged something; I assumed a submerged log because it wasn’t fighting, just dead weight. “Goddamnit.” I felt the drag slip as I turned the reel handle. I raised the tip of my seven-foot rod and something white broke the creek’s rippling surface about twenty yards away in a spot of bright sunlight. “What in hell you got hooked to?” Jackie said. In a few seconds it came closer, the current pushing it toward the bank where we stood. “Good thing you’re usin’ a rod big enough ta catch a tuna,” Jackie said. I drew the object closer to the shore.